Use to position a bass bridge while under string tension. Use to tighten or loosen Caspari pegs. Use under feet to raise cello bridge height. Use to clamp glued seams. Use to clamp re-glued instrument components. Use as substitute for hide glue. Can be used in the absence of hide glue if you have training to glue seams. Use to provide better hold between the peg and pegbox. Use to drill a new string hole in peg. Use as substitute for cork on chinrest bracket. Use to work glue into an open seam. The Sunbeam “Hot Pot Express” is another inexpensive product that can be used to quickly warm water. Use to measure even spacing between string grooves on bridge or nut. Use to create string grooves in bridge and nut. Check the instrument for open seams. Tap around the edge of the face and back and listen for spots with a more “hollow” sound. Lightly drag your fingernails across the seams and listen for a different sound. Open seams can be confirmed by carefully pushing the top or back away from the rib with your thumb. The seam is open if there is movement. Gently pull up on the fingerboard and check if it lifts from the neck of the instrument at all. It should be firmly glued in place. If any cracks are visible in the face or back, examine by pushing on each side of the crack independently. If one side moves freely the crack is open. Buzzing can be caused by fine tuners or the tailpiece touching against the top, saddle, or chinrest. Ornamentation on the pegs can come loose and buzz. Check if string holes are drilled in the center of each peg so they do not interfere with the peg box walls. This is a common source of problems. Make sure the top nut is an appropriate height. This can be checked by sliding business cards under the strings up to the nut. The nut height should be between one and three business cards tall. Visually check if the bridge is centered on the fingerboard. Likewise, check if the bridge grooves are centered. Having a good quality metric ruler is very helpful. 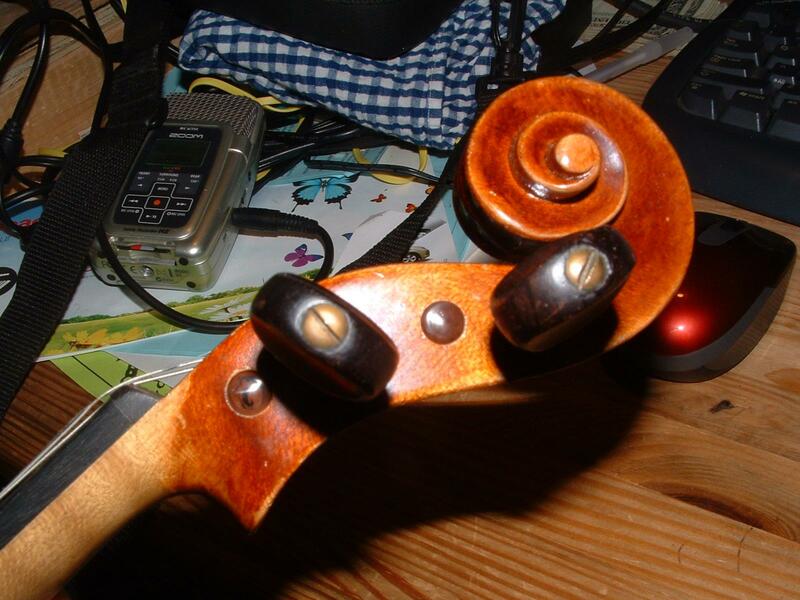 With Basses: Check the “butterfly” handles of the machine head tuners, which can come loose from the shaft. Check if the screw in the center of the round gear has come loose with a large flathead screwdriver. Also, check for slack and wear between the screw head and the worm gear. Lastly make sure the endpin works freely and doesn't slip.